The scan I used was already beautiful the way it was, so I just decided to change certain things rather than extracting the characters. 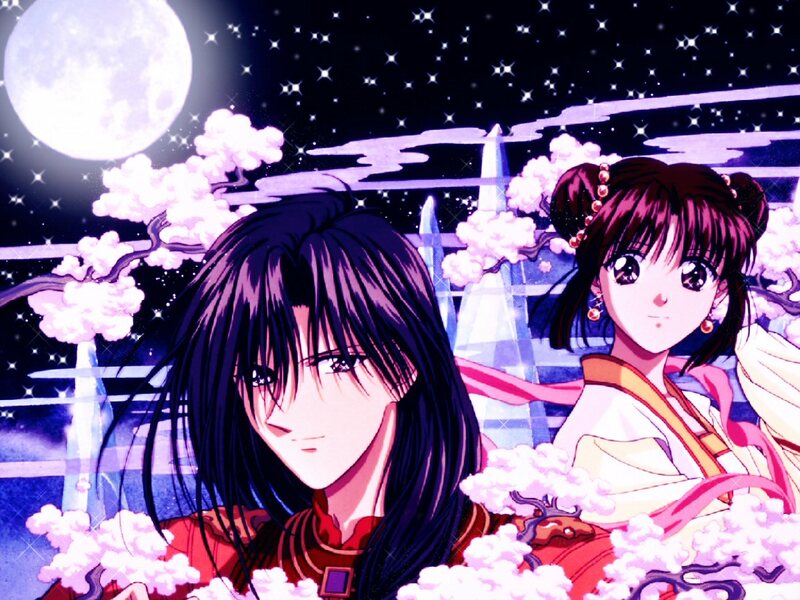 I had originally planned to use more of the it in the wallpaper, but like an idiot I forgot to save as I worked and lost 3 hours worth of fixing several of the mistakes in the scan (the blossoms on the top seem to come out of nowhere and Miaka’s sleeve is incomplete), so I got frustrated and just decided to cut them off, and only fix the branch on the left in the new version. I also added more sky than was originally in the scan, and I deleted the blossom-puff thing that was in Hotohori’s hair. It just didn’t look right to me, haha. Next I added the moon, which is a stock from deviantART, and added the glow by just going over it with a big airbrush and lessening the transparency. Throughout the creation of the wallpaper, I also added several layers of blues, pinks, and purples with layer blends to get the color to the way it is now. I was going for something of a shining moon effect. Then came the stars. Those were relatively easy, I just used a brush and erased everything that wasn’t over sky. Sorry I can’t give proper credit for the brushes, I downloaded them so long ago I can’t remember where they came from. I finally though I was finished when I reviewed the sizing requirements on MT, and saw that the resolution I had used (1200x900) wasn’t accepted so I had to resize. That messed up so many of the edges, especially around the characters’ faces, and I had to fix them and clean it up. I’m horrible and cleaning and digital painting so I know I didn’t do a perfect job but I tried. This was a good opportunity to practice at it. Anyway, this is my finished result. I know it’s not as good as some of the wonderful wallpapers on here, but I tried hard to make it nice. I think it’s okay for a first real try at making a wallpaper to submit. Please comment. Constructive criticism will be welcome, I really want to improve my skills. Thank you! Update - I took the suggestion in the comment (thank you, by the way). The white dots were there from the scan; there were some sparkles around the blossoms on the bottom but I cut them off, so I guess the others didn't match too well. I cleaned off many of them and used a glitter brush to make the others fit in more.